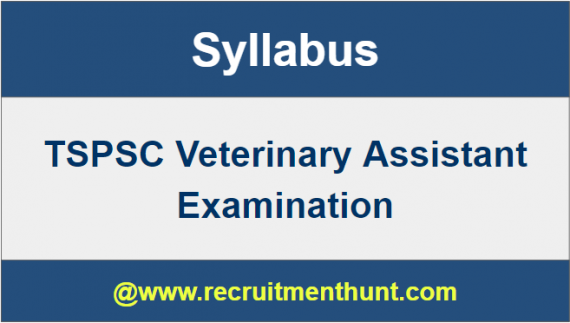 TSPSC Veterinary Syllabus: The complete details regarding TSPSC Veterinary Assistant Syllabus and TSPSC Veterinary Assistant Exam Pattern 2019-20 have been updated on this page. So, the candidates who are going to attend TSPSC Veterinary Assistant Exam 2019 and looking for TSPSC VA Syllabus can download it from the below section. The applicants can also check TSPSC Veterinary Officer Exam Pattern 2019-20 from here. Veterinary Assistant Job 2019 Vacancies will be announced by TSPSC Veterinary Recruitment Board based on their requirement. Candidates who are going to apply for the TSPSC Examination should make their preparation plan for their examination. Aspirants should go through the post completely to know about TSPSC Syllabus & Exam Pattern which is updated in the below sections. For other details like TSPSC Veterinary Previous Papers and TSPSC Veterinary Admit Card candidates can visit our website i.e, www.recruitmenthunt.com. Telangana State Public Service Commission has recently released TSPSC Notification 2019 for recruiting the qualified and passionate candidates for Veterinary Assistant Posts in Animal Husbandry Department. So, the aspirants who are waiting for TSPSC Notifications 2019 can utilize this opportunity and should apply for the TSPSC Recruitment 2019 for Veterinary Assistant Posts immediately. The individuals are selected for these TSPSC Govt Jobs 2019 based on their performance in the Written Test and Personal Interview. The applicants who qualify the Written Exam will only eligible for next round. So, the contenders must work hard and prepare thoroughly for the written examination by downloading TSPSC VA Syllabus & Exam Pattern which is provided below. Aspirants who applied for Telangana PSC Recruitment 2019 for Veterinary Assistant Posts in Animal Husbandry Department of TSPSC are facing problems while searching for the TSPSC Veterinary Assistant Syllabus & Exam Pattern. Hence, as a solution for their problem, we have provided the detailed Telangana PSC Syllabus for Veterinary Assistant Jobs on our page. Therefore, all the competitors of TSPSC Jobs can check and download the TSPSC Veterinary Assistant Exam Pattern & TSPSC Veterinary Assistant Syllabus from the below sections and should start their exam preparation as soon as possible. Visit our website Recruitment Hunt regularly for latest updates regarding all Government Jobs, Syllabus, Previous Papers, etc. The TSPSC Veterinary Exam consists of two sections and each part contains 150 objective type multiple choice questions for 150 marks. In the first section, there will be questions from General Studies and General Abilities and the other contains Animal Husbandry subjects. The entire subject wise syllabus for Telangana Public Service Commission Veterinary Assistant is as follows. Indian Constitution and Policy with a focus on local self Government. Artificial Insemination and Pregnant Animal Management. Veterinary Health Care Unit – a day to day duties & activities. Finally, Candidates can download TSPSC Veterinary Syllabus here. So, Applicants can make their preparation easier by following TSPSC Veterinary Exam Pattern. Download TSPSC Veterinary Syllabus & Exam Patterns along with TSPSC Veterinary Previous Year Question Papers 2019 on this article. Also, For more Job Updates stay Tuned to our site Recruitment Hunt.